For those of us who are Christians, we might think we have this praying thing down. We were taught in Sunday School or CCD or perhaps we were taught in a class prior to joining our church. But somehow knowing we should pray and actually doing it each day are very different things. 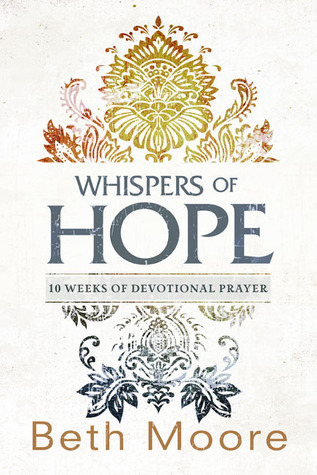 In Whispers of Hope, beloved writer Beth Moore gives readers ten week of devotions and teaches them to pray daily and powerfully. Ms. Moore divides prayer into six elements - praise, repentance, acknowledgement, intercession, supplication for self, and equipping. While prayer is an immensely personal thing, this way of praying has many advantages. Remembering to praise God and to give Him authority over your life each day strengthens your relationship immensely. Interceding, or praying, for other people helped me to think about the people I care about and find out the things that were happening in their lives. I know it messes up the acronym (PRAISE), but I found myself wishing that Moore had placed repentance and supplication for self next to each other. If we are going to admit the things we are struggling with, then it makes sense to next ask for help with those same things. The devotional sections of this book each come with a scriptural reference. The topics that are covered vary, which means you will be studying many different Biblical principle but there is no thread connecting the reading in this book. Moore writes about things as diverse as the character of God, how to unify the church, boldness in prayer, and the timelessness and power of the Bible. This book practically begs to be heavily used. There are lines for each day after each part of prayer, so you can record the things you rejoiced over and the things you petitioned God to receive. At the end of the book, you can note which prayers were answered and how they happened. Whispers of Hope is perfect to use by yourself or with a group. There are directions in the back of the book if you choose to work through it with other people. If I am being honest, it took me longer than 10 weeks to complete this book. Life sometimes got in the way and I neglected to take the time to read and pray. But I feel more confident in my prayers and, as a result of reading this study, I am now in the habit of starting my day with time with God. I would recommend this book for the new believer and the lifelong Christian alike - we can all strengthen our time with God. Beth Moore does such a great job. Yes, she does. Which of her other books would you recommend, Sheila? ?